The N.C. Chronicles. 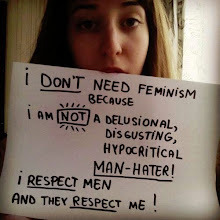 : Feminazis, exposing the truth. Actually we are living a desperate situation here in Europe with the feminazi problem. Men has no rights. As simple as that. Behind the Femi-Nazis are the main media in Canada, and elsewhere, that in its lies and political anti-male extremism would be the envy of even the former Nazi propaganda minister Goebbels, but also of the parasites of the billion dollar Family Destruction Industry on and off the bench, which is one of Canada's largest industries that fleeces separating average income families of all their money; what evil human garbage. They need the 2% femi-Nazi extremists that the media crooks have turned into a major movement. Boycott the main media and let them know why. I agree the media and other use the fem movement to advance their own idealism or greed. They are a tool and are too full of hatred to realise it...They are a small minority, yet with the help of dark forces, are destroying the very fabric of a stable society, AKA, the family. Question is, what will come next, what is the ultimate goal of these dark forces.